Mecca Bingo | Claim £30 Bonus when you join NOW! Mecca Bingo is one of the flagships online bingo sites for 2016. The brand has an established a fabulous reputation, both as a top online bingo site and an entertaining live bingo hall brand. While many fans are familiar with the brick-and-mortar Mecca Bingo halls, the site is just as fabulous. Mecca Bingo online offers a stunning interface, glamorous graphics, star-studded promotions and a rich variety of top bingo games and slots! When you join Mecca Bingo you'll receive a £30 welcome bonus when you deposit your first tenner, plus 7 fabulous free bingo days in the Newbie room. The sign-on form is simple to fill out and you can be playing in no time! Once your a full member, Mecca will treat you to a jam-packed range of exciting promotions and perks. Mecca Bingo guarantees £150,000 worth of prizes every week. Some of the highlights include the spectacular £1 Million Bingo Prize Draw, the the £100K Slots Draw and the BingoLinx Jackpot. Other hot promos include the £500K Value Nights, £30k Winners Night, £1 million bingo game, £50K Cash Cubes giveaway, £50k Fridays and loads more! There are always Mecca Bingo Promo Codes running on the site! Check here for the latest exclusive offers! 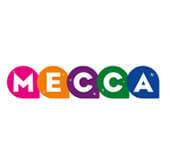 Mecca Bingo has a bustling chat community with entertaining chat games and chances to grab extra prizes. There are also offers some great online community-building activities, like Roomie of the Week competitions, pet of the month, and a weekly caption competition that can win you £100. Mecca Bingo offer a stunning range of themed main 75-ball and 90-ball bingo games. If you fancy a flutter and are pressed for time, there are also games that last only two-and-a-half minutes. There are many side games, and you can also enjoy thrilling Casino games including slots, keno and scratchcard games. Some of the top online slots games titles include the new Fairground Fortune, WWTBAM Scratchcard, Deal or No Deal, Bouncy Balls, Bejeweled, Pyramid and many more There is also a game called Celebrity Top Trumps which sets up stars like Johnny Depp versus Robbie and Madonna versus Jordan to see who comes out on top. Keeping with the celebrity theme, Mecca Bingo also provides a weekly gossip column on the site and plenty of bingo jokes! The Mecca Bingo’s Mobile App is one of the top mobile bingo clients available. The app is available on multiple platforms including iPhone, iPad, Blackberry and Android devices. Mecca also has exclusive mobile bingo promotions including a massive £40 Welcome Bonus, an iPhone 6 Giveaway, free cash giveaways and loads more promos. There are also exclusive Mobile promos available on slots and instant games in addition to bingo promos! As would be expected of Mecca, their mobile games selection is absolutely massive. Simply log in to the site or Mecca Bingo mobile app from your phone or tablet. Then you can access fabulous games like 90 ball bingo, cashline interval game, Bin-glo free play bingo app and loads more. Some of the best instant games available on mobile include Rainbow Riches, Cleopatra, Da Vinci Diamonds and Leprechaun’s Luck. You can also enjoy casino games like poker and blackjack on the go!